For Rosalina's up special, see Launch Star. The Super Launch Star in Super Mario Galaxy and Super Mario Galaxy 2. 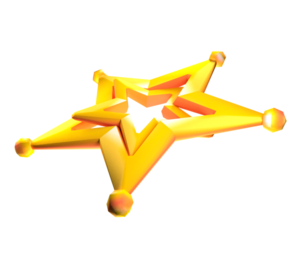 The Super Launch Star (スーパースターリング, Super Star Ring) is an item in Super Smash Bros. Ultimate. A Launch Star in Super Mario Galaxy 2. Launch Stars are integral parts of both Super Mario Galaxy games. When Mario or Luigi jumps inside one, he launches along a set path, usually to another planet in the galaxy he's currently in. Ness being launched by the Super Launch Star. The Super Launch Star spawns on the stage like most items. When picked up and thrown, however, it will become larger and float in the air. The Super Launch Star will aim in the opposite direction of which it was thrown. Whenever a character touches a Super Launch Star hovering in the air, it will launch them, doing no damage but dealing heavy knockback. The knockback will scale up with damage and is usually well enough to rocket characters over blast lines, especially if the Super Launch Star was pointing upwards. This makes the Super Launch Star one of the most dangerous items in the series. The Super Launch Star will stay in place for around 10 seconds after being thrown, before despawning. Equipping the Luma, Warp Star, Gracie, Ouendan Cheerleaders, Elite Beat Divas or Shop Assistant Support Spirits will give the player a Super Launch Star at a start of a match. Official artwork of the Super Launch Star in Super Smash Bros. Ultimate. This page was last edited on April 11, 2019, at 14:04.